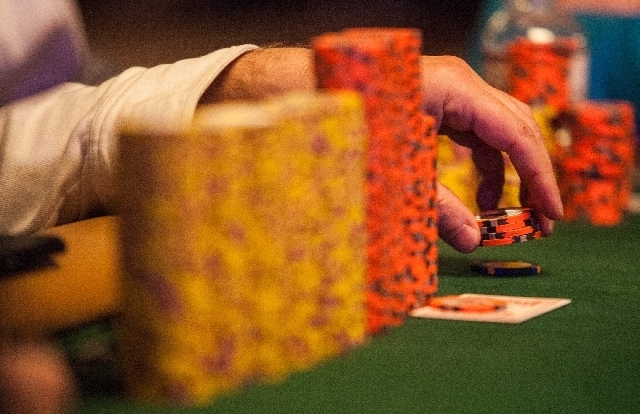 It’s a test of endurance, both mental and physical, when 12-hour days begin piling up at the poker table. Sarah Herzali was feeling it Friday night. Sarah Herzali, 25, of Marseille, France, eyes her opponents during the World Series of Poker Main Event on Friday at the Rio Convention Center. 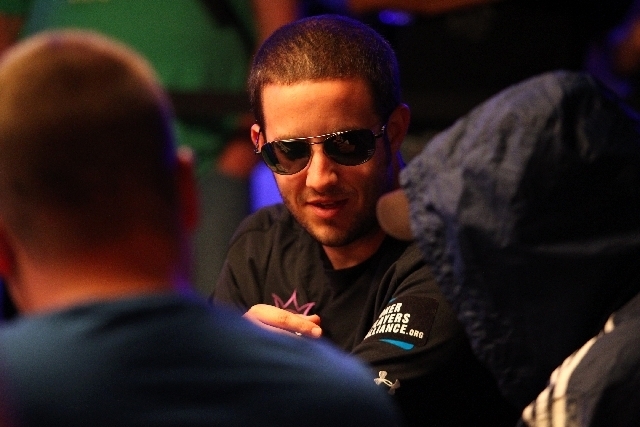 Herzali and seven other women were among the 283 players still in the event late Friday. 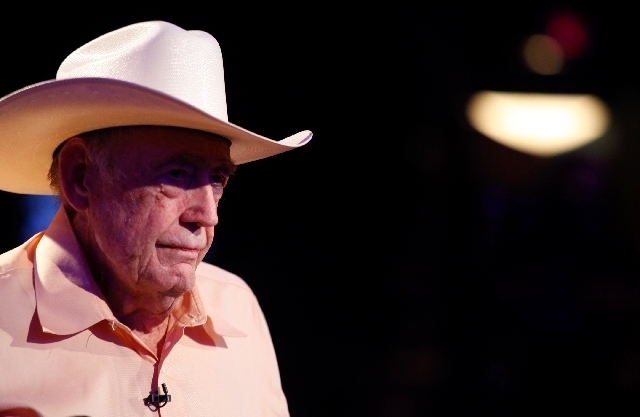 Poker icon Doyle Brunson, 79, is shown after being eliminated from the World Series of Poker Main Event on Friday at the Rio Convention Center. Brunson, who won the Main Event in 1976 and 1977, finished 409th in the $10,000 buy-in event and won $28,063. Greg Merson plays during the fourth day of the World Series of Poker Main Event at the Rio Convention Center in Las Vegas on Friday. 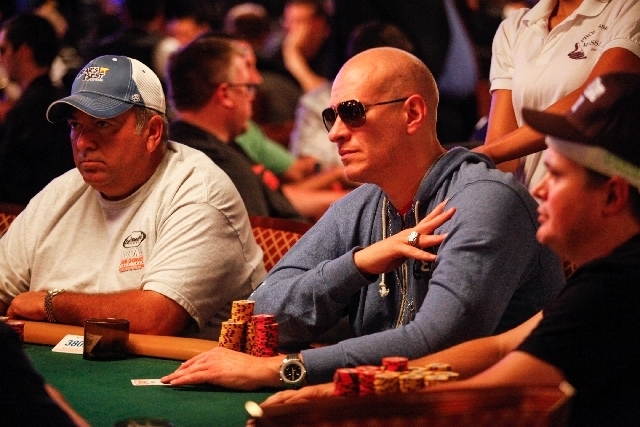 Greg Mueller, two-time World Series of Poker bracelet winner, plays during the fourth day of the World Series of Poker Main Event at the Rio Convention Center in Las Vegas on Friday. Mueller resembles John Malkovich, who played Teddy "KGB" in the movie "Rounders." Spectators gather closely during the fourth day of the World Series of Poker Main Event at the Rio Convention Center in Las Vegas on Friday. A poker player fiddles with chips during the fourth day of the World Series of Poker Main Event at the Rio Convention Center in Las Vegas on Friday. 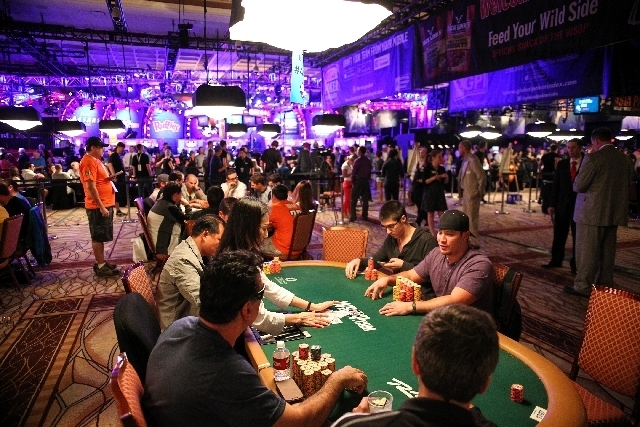 Seats are empty as players are eliminated during the fourth day of the World Series of Poker Main Event at the Rio Convention Center in Las Vegas on Friday. Ricardo Lacchinelli, center right, is seen as a Hello Kitty figurine sits atop his chips during the fourth day of the World Series of Poker Main Event at the Rio Convention Center in Las Vegas on Friday. Legendary poker player Doyle Brunson is seen after being eliminated during the fourth day of the World Series of Poker Main Event at the Rio Convention Center in Las Vegas on Friday. “It is some pressure,” the 25-year-old from Marseille, France, said as the World Series of Poker Main Event hit its fourth day at the Rio Convention Center. A team of massage therapists tend to the backs, necks and shoulders of tiring players. But, as Herzali indicated, the high-pressure situations wear more on the players as the stakes get raised. The $10,000 buy-in No-limit Texas Hold ’em World Championship field of 6,352 players was cut to 666 after the third day and to 283 by 11:30 p.m. Friday. Max Steinberg was the front-runner with 1,795,000 in chips after the dinner break, holding off Jason Cohen (1,785,000) and Jonathan Lane (1,732,000). But the lead was changing hands almost by the minute, and Jason Mann and Grayson Ramage each topped 2 million in chips, with play scheduled to continue until 12:45 a.m. today. The tournament will resume at noon. 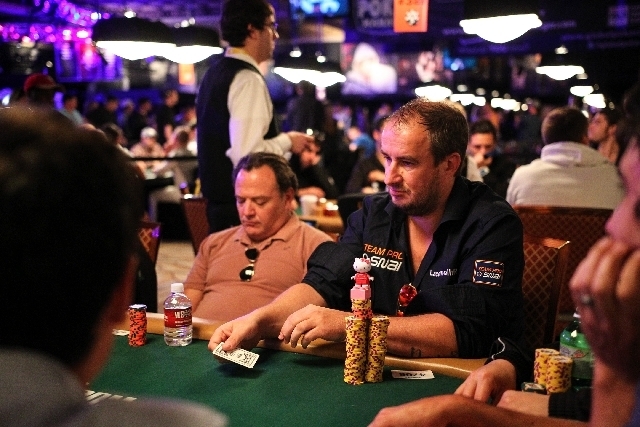 Defending champion Greg Merson, sitting behind 803,000 in chips, put himself in position to be a big story over the weekend. 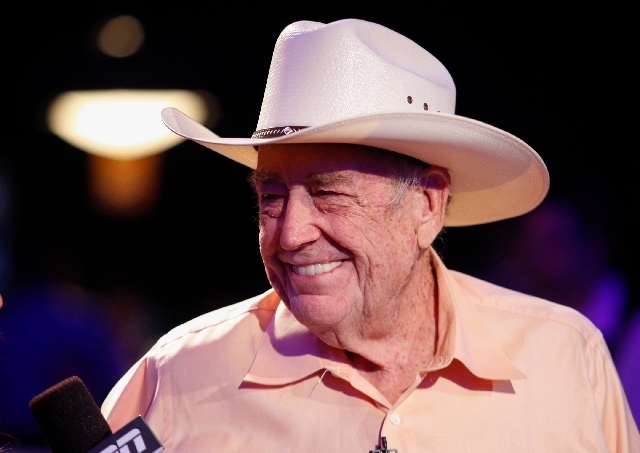 Doyle Brunson, 79, did not make the cut. The inspiring tale of “Texas Dolly” ended at 6 p.m. under the bright lights of the ESPN stage. “I know of him, but I had not played with him before,” said Sergei Stazhkov, who played the role of the bad guy by knocking out Brunson. On his final hand, Brunson bet 86,000, Stazhkov briefly paused before re-raising all-in, and Brunson called all-in for 204,000 with K-10. Stazhkov showed a pair of 10s. The flop was no help to Brunson, and it was more of the same with the turn and river cards. Brunson exited to applause and sped off down the hallway on his motorized scooter. Herzali was one of eight females still in action late in the evening. 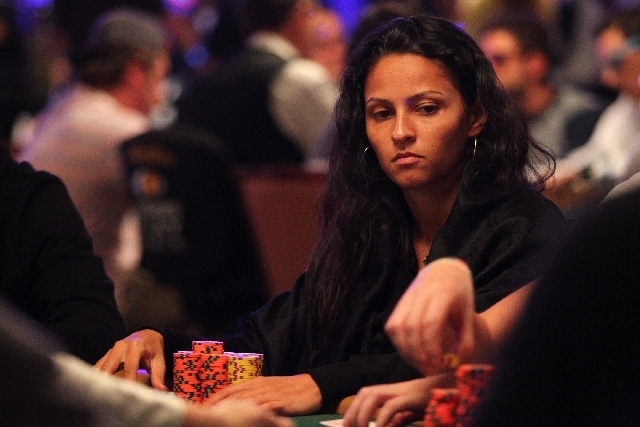 She went to dinner with 300,000 in chips, after losing 137,000 on a hand before the break. Nevertheless, her second trip to Las Vegas for the Main Event paid off. 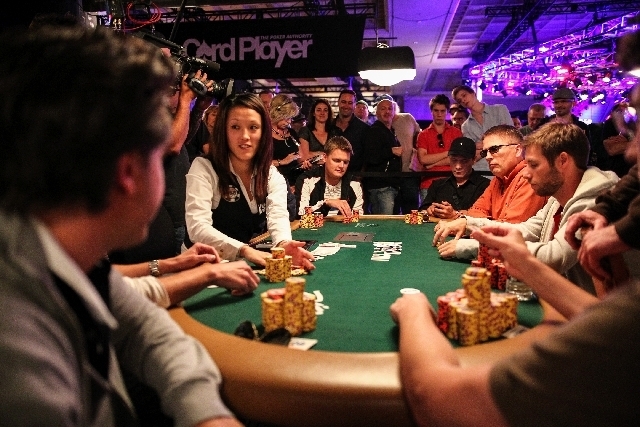 The final 648 players made the money. Annette Obrestad, 24, a Norwegian player who won the 2007 World Series of Poker Europe, was the top female with about 1.2 million in chips. But Australian Jackie Glazier, who returned from dinner with 446,000, was making a strong run at being the leading lady. Herzali was three seats to the right of Brunson when he bowed out, and she might have been witnessing history. Brunson, who won the Main Event in 1976 and 1977, finished in 409th place and cashed out for $28,063. There is a sense this World Series will be Brunson’s last. But, as for that question, he wasn’t tipping his hand.